177 students were seen by representatives from 14 colleges, universities and trade schools, and 137 were accepted on the spot. William Floyd High School recently held an On-Site College Admissions Day. 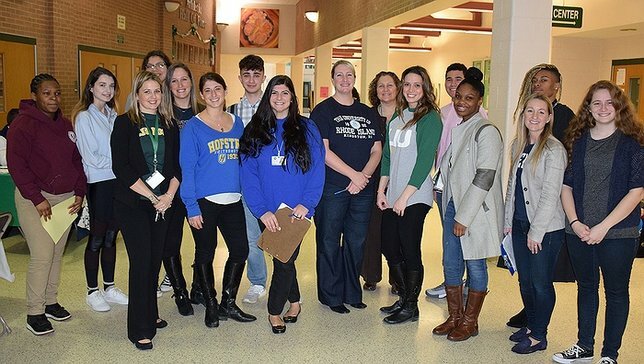 Mastic Beach, NY - March 5, 2018 - The William Floyd High School Counseling Center recently held its third On-Site College Admissions Day of the school year to provide students with the opportunity to have one-to-one conversations and meetings with admissions counselors from many local colleges and universities. Counselors were on hand to discuss students’ specific plans, each college’s offerings, as well as to evaluate the students’ transcripts and applications. At this event, 177 students were seen by representatives from 14 colleges, universities and trade schools, and 137 were accepted on the spot with the remaining pending for further consideration. Earlier in the school year, the Counseling Center organized two specific admissions days with Suffolk County Community College admissions representatives with approximately 180 students gaining acceptance on the spot. So far this year, the Counseling Center has facilitated meetings between students and colleges for nearly 60 percent of the graduating class of 2018. Colleges, universities and trade schools in attendance this year were: Suffolk County Community College, Farmingdale State University, Mount Saint Mary, BOCES, Hunter Business School, SUNY Albany, St. Joseph’s College, NYIT, LIU Post, SUNY Old Westbury, SUNY Delhi, Molloy, Five Towns and SUNY Fredonia. Additionally, four of the private colleges – LIU Post, Mount Saint Mary, NYIT and St. Joseph’s College – confirmed the awarding of nearly $305,000 in scholarships to deserving students should they choose to attend those institutions. This On-Site College Admissions Day was held during National School Counseling Week, held during the first week of February, designated to recognize and highlight the tremendous impact that school counselors have in helping students achieve success in school and plan for a future career. Promote Your Business to Thousands In One Day at the 38th Annual Riverhead Country Fair! Subject: LongIsland.com - Your Name sent you Article details of "WFHS Counseling Center Hosts Successful On-Site College Admissions Day"